Replacing the belt in a Kenmore clothes dryer is a simple repair that can have your dryer up and running again in no time. But before you can replace the belt you must be reasonably certain its the belt that is causing the problem. If you heard a loud noise coming from the dryer just before its drum stopped spinning, the sound you heard was probably the belt braking. If you open the dryer and find the belt intact, consider troubleshooting the dryer's motor as a possible solution to the problem. Keep your do-it-yourself repair safe by making sure that you dryer is unplugged from its power source before proceeding to the next step. Open the top panel of your Kenmore dryer. Remove your dryer's lint screen and lint screen housing screws. Release the clips that secure the top panel to your dryer by using a putty knife to apply pressure to the metal clips underneath the panel. Lift the top panel up and fold it over the back of the dryer or lean it against the wall. 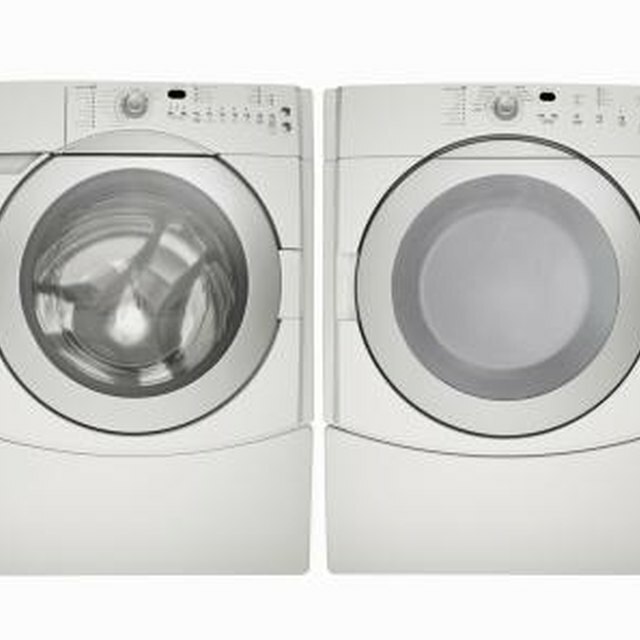 Access the drum of your Kenmore dryer through its front panels. Start by removing the dryer's bottom toe panel. Locate the metal clips approximately 3 inches in from either side of the toe panel. Apply pressure to the clips with a putty knife to release them. Use a screwdriver to loosen the screws that secure the bottom of your dryer's front panel. Locate the corresponding screws at the top of the front panel and remove them. Pull the top of the front panel toward you so that you can access the dryer's drum. Fit the replacement belt over the dryer drum. Line up the replacement belt next to the old belt. Take the old belt off and move the replacement belt into its place. Turn your attention to the dryer's motor, located to the bottom right side of your Kenmore dryer. Pull the dryer's idler pulley to the right and feed the belt through it. Hook the belt around the motor pulley and then let go of the idler pulley. Give the drum a couple of counterclockwise spins to make sure that you've installed the replacement belt correctly. Reassemble your Kenmore dryer to complete your dryer belt replacement. Attach your dryer's toe panel by lining up the metal clips and snapping the panel in place. Tighten the screws you loosened at the bottom of the dryer's front panel. Replace the corresponding screws at the top of the front panel and tighten them until the panel is secure. Fold the top panel back over the dryer cabinet and apply pressure to it until it clicks into place. Return the screws to the lint screen housing and replace the lint screen. Using a magnetic tipped screwdriver can make it easier to remove and replace screws while repairing your dryer. If you aren't confident in your ability to replace the belt on your Kenmore dryer, save yourself a frustrating experience and contact Kenmore customer support to schedule repair service.